Our preferred method to cool, and invented by MoreBeer! customer Jamil Zainasheff. How it works: Wort travels from the kettle to a pump and back into the kettle via a short copper arm that aims the hot wort into the wall of cooling coils. This creates a flow of hot wort across the coils of your wort chiller and throughout your kettle. The movement of wort creates a fast heat exchange, and uses far less water than a traditional wort chiller. Recirculating the wort in the same vessel allows you to continue chilling until your wort gets to the proper pitching temperature before transferring to your fermenter. Add a thermometer into your boil kettle to get consistent results every time! Start recirculation before the end of the boil so everything the wort moves through will be sanitized. Most of the chilling happens on the outside of the coil allowing for a much simpler cleanup. Comes with instructions, 2 zip ties, one hose clamp and copper re-circulation tube 1/2". This system does require the use of a pump, like our H315HF High-Temp pump. 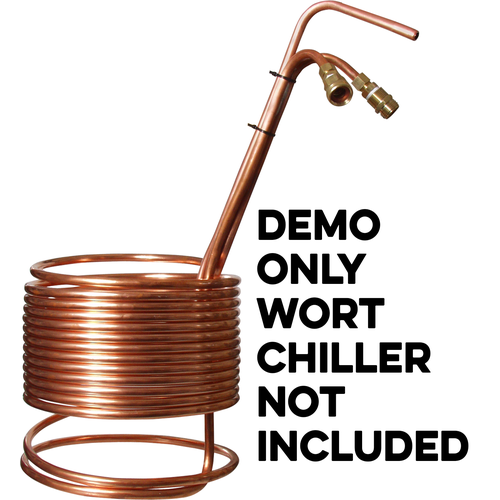 A wort chiller will need to be purchased separately. This option works on our WC30, WC45, WC50, and WC55 only. 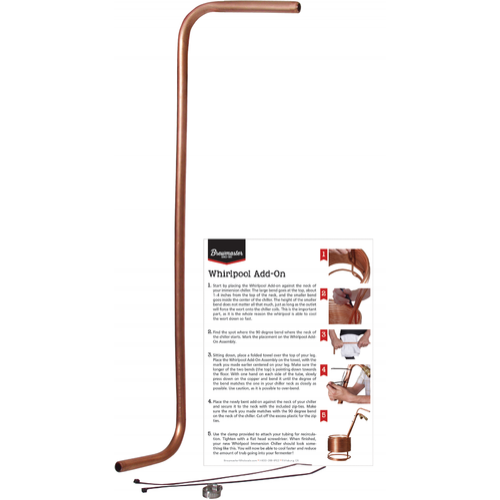 25 1/2" Double Bent 1/2" Copper Piece For Recirculation Chilling Bent Perpendicular 90 Degrees at 5" and 5"
This product is an excellent option for cooling wort quickly. I have it attached to my 1/2", 50' copper wort chiller, which can drop my 5 to 10 gallon wort temperatures over 100 degrees (F) in about 2 minutes. Overall, I prefer this option over counterflow or plate chillers because it cools the entire kettle of wort all at the same time, allowing me to control my hopstand time with more precision. In addition, I don't need to manually whirlpool after the boil. I simply start whirlpooling 5-10 minutes before the end of the boil to sanitize everything, then after the cooling period, I shut it off and let the cold break and hops settle for about 20 minutes. It's all clear wort from there. Very cost effective option for extending the range of your IC. I used this back when I used a 25' Immersion Chiller (IC) and brewing 10 gallon batches. creating a constant flow of wort against my IC was necessary to bring wort down to lager pitching temps in a reasonable amount of time. In the end, my IC was just too small for lagers (It took me almost an hour once) and I decided to go with a short manual whirlpool for 15 min and then a pass through a plate chiller. It turns out you can get a better hop cone with a short manual whirpool since there are less things obstructing flow. For those that insist on an IC, this is the way to go. I would recommend using hose clamps on the end of the whirlpool arm when connecting hose to it. Hose will stay, but it's not worth risking. Also, the plastic clamps that come with the arm wear out and the arm falls off the IC after a few brew sessions. I recommend checking this before every brew session. This works so well! Thank you MoreBeer for thinking of this! I bought this to aid in my cooling process with my immersion chiller. It greatly speeds up the end of my brew day. I find it works best when i've cooled the wort down to the low 100s with ground water, then switch to ice water in the immersion chiller using a small garden fountain pump. I was going to build my own considering the simple nature of the whirlpool arm, but it was actually cheaper to purchase and ship the arm from MoreBeer than it was to buy a short length of copper pipe at a local home supply. Requires a little modification (shaping) to get a good whirlpool going in your individual system, but once adjusted it does a great job. I use an immersion chiller and it cut my chilling time (and water use) by 1/3. This recirc arm is easy to install onto an existing immersion chiller. Very easy to do and creates a nice whirlpool. Super simple - I should have though of it! Add this to your wort chiller to keep the wort agitated and increase your chilling efficiency. Super simple design but it does the trick! You do need to have a pump to make this happen.